A demographic hungry for upscale apartments with plenty of space, along with open and functional floorplans, is filling their appetite at Vine in Hoboken. Vine, located on the western edge of this Hudson County City, consists of 135 residences. With more than 1,300 square-feet and two full bathrooms, the three-bedroom rentals at the amenity-rich building are proving to be the perfect fit for roommates who have been seeking a new level of luxury in the vibrant mile-square City. The homes – which boast a walk-in closet, in home washer and dryer, open kitchens, traditional living/dining area and expansive bedrooms – offer a design that not only provides comfortable shared living space, but also allows for a considerable privacy. Complementing the three-bedroom homes at Vine, one of the newest rental buildings to be introduced in Hoboken, is an amenity-package that appeals to the active professional lifestyle. Found throughout the 11-story building are a pool and outdoor deck with individual barbeque stations, separate outdoor lounge areas, poolside sunbeds and lush landscaping, clubroom and fitness center, bike storage and free shuttle service to the nearby Hoboken PATH station. Net effective monthly rents for the three-bedroom homes at Vine begin from $ 4,495. Developed by Bijou Properties and Intercontinental Real Estate Corporation, Vine has quickly surpassed the mark of 70% leased. In addition to the three-bedroom homes, a mix of one- and two-bedroom apartments are also available at the building, priced from $3,115 (net effective rent). Residences are available for immediate occupancy. Homes at Vine boast a number of designer and energy-efficient features, including sustainable bamboo flooring, oversized windows, kitchens and baths with modern fixtures, Frigidaire and Bosch Energy Star appliances, granite countertops and modern cabinetry. Lavish baths with porcelain tile are also a staple at Vine. 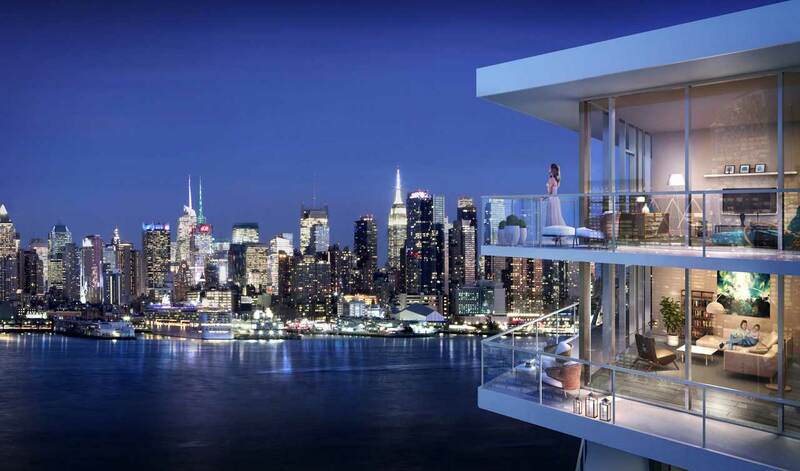 blends an upscale living experience with the convenience of quick access throughout New Jersey’s Hudson River “Gold Coast,” including Hoboken’s PATH, New Jersey Transit and Ferry terminals with service to Manhattan. For additional information on Vine, please visit http://www.vinehoboken.com or call 201-386-VINE (8463). The Marketing Directors’ onsite Leasing Office is located at 900 Monroe Street, Hoboken, NJ 07030.